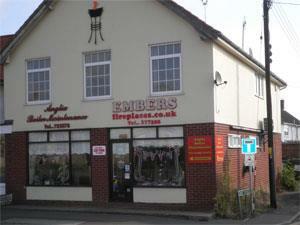 Embers in the village of Caister-on-Sea near Great Yarmouth, specialises in the sale and installation of gas fires, electric fires, flueless fires and many fireplaces, mantlepieces and fire surrounds. On arrival in Great Yarmouth follow signs for the A149 to Caister-on-Sea, proceeding straight ahead at the mini roundabout just past Yarmouth Stadium and straight ahead over the next three roundabouts. Embers is then located on the right hand side just opposite the Police Station.